I'm always on the lookout for nifty little projects that will allow me to use up some of my small fabric scraps. This little pocket pack tissue holder is super quick to make and would be perfect to tuck inside a zippered pouch as a present. 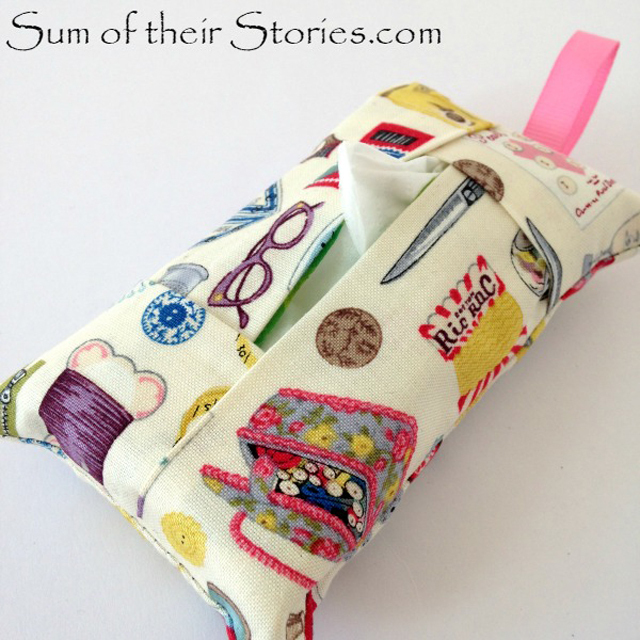 Julie, from Sum of their Stories, shows how to make the Easiest Pocket Pack Tissue Holder Ever. Mix and match five different fabrics or make one up all in a single colour. Co-ordinate two or three fabrics for a different effect. With the largest piece of fabric only needing to be 6" x 4", make a bunch and turn lots of your scrap fabric stash into presents for friends. I think I could easily whip up several in an evening. I love this! It is so hard when kids need to carry tissues to school, clogging up their pants pockets. And then when you forget to pull them out for laundry day. :( I can't wait to make these. What a great idea and they can attach to a backpack easily. Thanks for showcasing these Pam, I had such fun making them and they used up a bunch of my little scraps, very satisfying! I hope others enjoy making them too. Thanks for sharing this brilliant idea. I've seen coasters made in a similar fashion. Never thought about doing this. This looks such a simple but ingenious method of construction, perfect for scraps.